Find out where to watch Miami football online on the official streaming media providers of the Atlantic Coast Conference and the Miami Hurricanes. We only list the legal, official digital media providers of Miami Hurricanes sports. Never click on Miami football live streaming links you don’t trust! ACC Football Online is a fan site that helps the fans find out where to watch Miami football online legally. We do not host illegal Miami football live streams or post links to games other than the official Miami Hurricanes football live stream. Bookmark ACC Football Online for all the legal, official live streaming football game links for all the Atlantic Coast Conference schools. 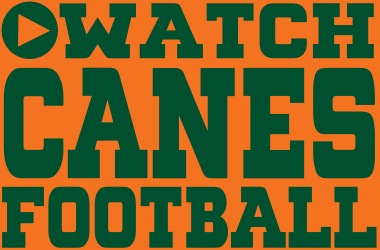 You can watch Miami Hurricanes football online on a mobile phone, PC and tablet. You can also watch the Canes football game on all types of streaming devices and smart phones now including iPhone, Roku, Xbox, PS4 and more. ACC Football Games Online – Search the directory of ACC football providers that show you where to watch Miami football online legally. Hurricanes fans can listen live and watch Miami football games online at Canes All Access, the official Miami football live stream. And, as a bonus, you get to watch live Miami basketball games, baseball, volleyball and more on the official Miami Hurricanes sports network affiliates. The Miami Hurricane Radio Network broadcasts every one of the Hurricanes football games live online. Nowadays with an Internet connection, you can watch the Canes game online and listen to local play by play of the Hurricanes football radio broadcasts online at the same time. And, for up-to-the-minute updates about Miami football visit Miami Hurricanes Sports from the Sun Sentinel. For the best Miami Hurricane football forums, try Canes Insight and Canes Time. The University of Miami was founded in 1925 in Coral Gables, Florida. 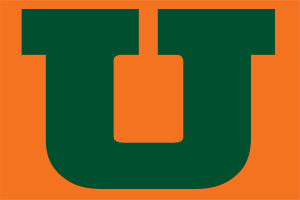 Miami began playing football just one year later, in 1926, and the official school colors are green and orange. The University of Miami plays its home football games in 65,000 seat Miami Stadium. The Hurricanes football team, by far the most successful team of the 1980s, has won five national football championships. The Canes official fight song is Miami U How Dee Do and the team mascot is Sebastian the Ibis. The Miami Hurricanes are a member of the Coastal division of the Atlantic Coast Conference. Visit ACC Football Online to get our Miami football information and learn how to watch ACC football games online during the season. Get football schedules and updates for every one of the ACC football games, basketball games, baseball games and more.